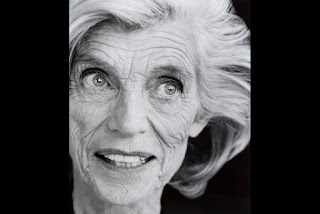 Since the Kennedy family is from Boston and they have their compound on the Cape, a lot has happened in Massachusetts in remembrance of Eunice Kennedy Shriver. The MFA will be showing 3 Herb Ritts photographs of Eunice in memorial (one image seen above). Her strong features will contrast nicely with the black and white nature of the photos, I think. Personally, the Kennedys fascinate me, and if you are interested in JFK Jr., you should definitely read What Remains by Carole Radziwill, a friend of JFK Jr. and Carolyn Bessette Kennedy. Lastly, whether you are a Dem or Rep, a Kennedy fan or not, you should also watch Maria Shriver's eulogy to her mother at Eunice's funeral last week. It's really powerful and shows the love and interesting dynamics of this fascinating family. I luv the Kennedys and this is VERY POWERFUL but it doesn't surprise me after all this is a POWERFUL FAMILY that has been through sooo much! It only proves how STRONG they are! p.s. I've heard about this book eventually I'll read it, Thanks for sharing ! ! !